The Geolandar H/T-S G051 is designed for the smaller end of the market in terms of SUV's and 4x4's, think compact SUV, and more on road SUV's. Due to the targeting of the smaller SUV the tyre is able to give handling and comfort levels normally associated with passenger car tyres, and is far more enviornmentally friendly than some of the others in it's class. The wet grip and high levels of durability within the tyre allow for superb handling in all conditions without comprimising comfort. The Yokohama Geolandar H/T-S G051 also ranks incredibly well in EU testing for noise emissions, scoring well above other tyres in it's class. 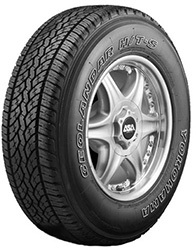 A great SUV tyre for on road drivers.